Kayak festivals are simple: Paddlers coming together at the same time each year to celebrate and enjoy the act of kayaking. The focus of each festival is different; some, like Sickline or King of the Alps concentrate on competition. While others, like Gauley Fest in West Virginia, were created to take advantage of the annual water release. And festivals like Saluda’s Green Race are a bit of both. Whether it’s a race-focused event or just an annual celebration of a river during its best seasonal flow, festivals are also a great excuse to book a week off work, gather the crew and paddle a new river. Like many aspects of the sport, kayak festivals have evolved. Many of the popular events now have big name sponsors attached and concerts; prize money and the size of the after party have become a measure for the event, sucking some of the soul out of the week or weekend. But each high profile event had roots in the local paddling scene and came from small-scale start. In Europe, new events are popping up each year, drawing paddlers to less technically challenging and more fun-oriented rivers—perfect for paddling clubs and those who want to incorporate paddling into a vacation. 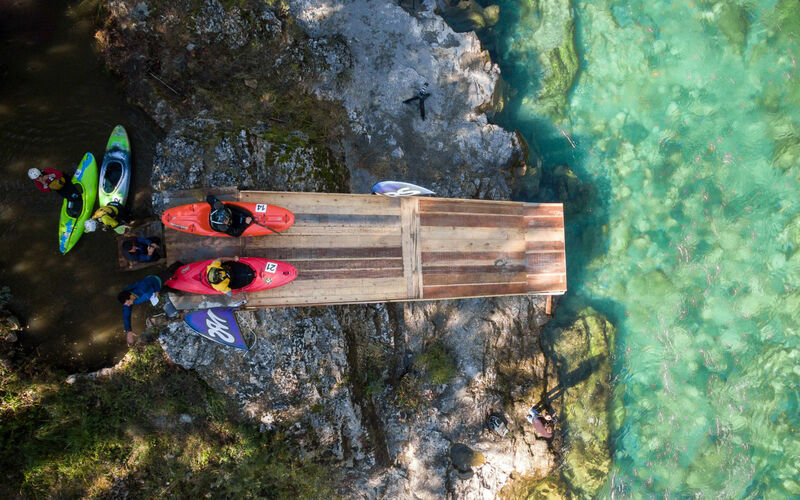 From a start line lined with fireworks on Slovenia’s Soča River to a mass start boater cross on the Kool-Aid blue whitewater of the Tara River in Montenegro, these budding festivals will blow your mind with their soul, simplicity, stunning landscapes and local passion for paddling. With water levels varying by region, this quick and dirty guide of paddling festivals in Europe has got you covered, no matter when your vacation days may fall. From June to November, here are three of the best European kayak festivals you’ve never heard of. Plan a Euro Festival Tour—some of these grassroots festivals have ‘big brother’ events in the same month or region making it easy to pair them up. This season, try out a smaller event, a new river and an all-inclusive festival that’s fun for a range of kayaking abilities, yet challenging for those looking for a solid racing fix. As darkness falls over the emerald water of the Soča River in Slovenia, things are just starting to heat up. The river is cold but the whitewater is lit up with floodlights. Fireworks shoot into the air from both sides of the ramp as a pair of kayaks launch off the wooden ramp and crash into the river in a full sprint to the finish line. 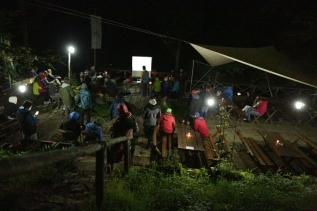 In collaboration with Soča Outdoor Festival, the race has been active for almost ten years, but the night race is just in its second year. Competitors can enjoy the flash and excitement of being a rock star, with the chill vibe of the tight knit community of Slovenian kayakers. Just a few steps from the picturesque campsite of Kamp Koren and within stumbling distance of the adventure town of Kobarid, the location doesn’t get any better. 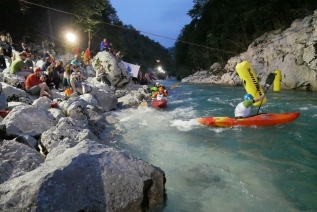 The race, called the Soča River Knight, begins in the evening with a mass start kayak cross race, where 45 kayakers sprint down a one-mile section of the Soča—from the bridge near the Kozjak-Soča confluence to the pool just after the notorious Napoleon Bridge outside Kobarid. 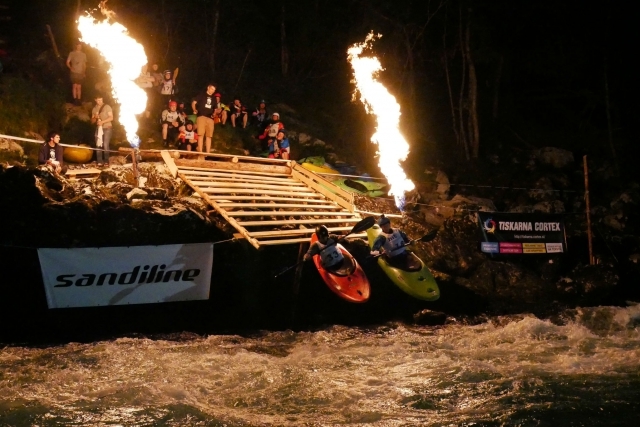 This race is a qualifier for the night race where the top 20 paddlers battle head-to-head down the lit up course lined with spectators just out front of the Kamp Koren bar. 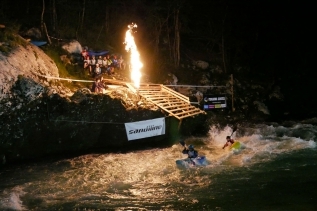 Fire works mark the start of each round, and the beers flow as kayakers vie for the title of Soča River Knight. Racing wraps up around 11 pm, the winner is ‘knighted,’ and the night continues with music, dancing and more cold beer— a proper party of Soča proportions. All-in-one event, all in one night, this is not your average race. The race entry fee is only 30 euro (approximately $35 USD) and includes the entry fee, post race meal, t-shirt and goodie bag. Camping is extra. Categories are men’s, women’s and topoduo and the event is kayak club friendly, offering 20% discounts for groups of four or more. 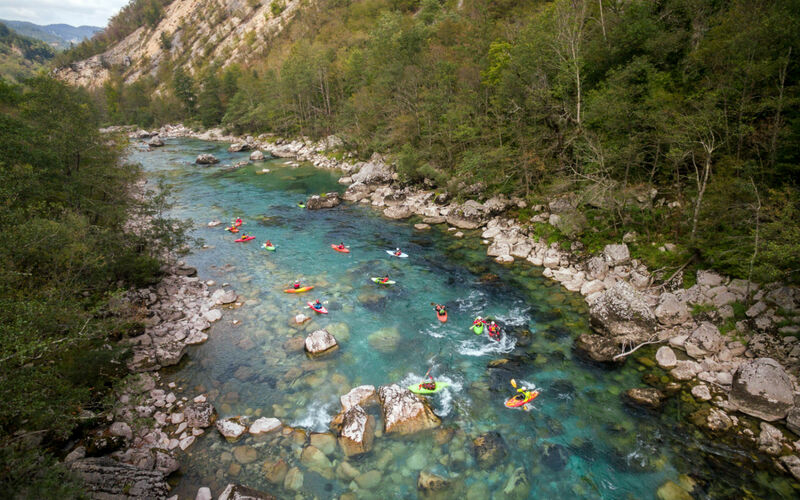 Soča River Knight is just one part of the larger Soča Outdoor Festival, an annual event that showcases all the adventure potential of the Soča Valley. 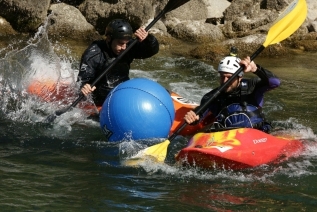 The main scene for the outdoor festival is in the town of Tolmin at the confluence of the Tolminka and Soča rivers. The week-long event includes trail running races (10km, 15km, 25km, 45km), SUP race, orienteering competition, mountain bike race and paragliding race. Combine that with outdoor concerts, open-air yoga, a sport climbing workshop and lots of activities for kids, this week in Slovenia guarantees to be a jam-packed example of Slovenian excitement. What can 50 euros get you these days? Maybe a case of beer, maybe two, a pair of jeans or a dinner out? How about a full weekend in the wilds of Montenegro, kayaking, racing, camping, eating and partying on the tropically turquoise Tara River? 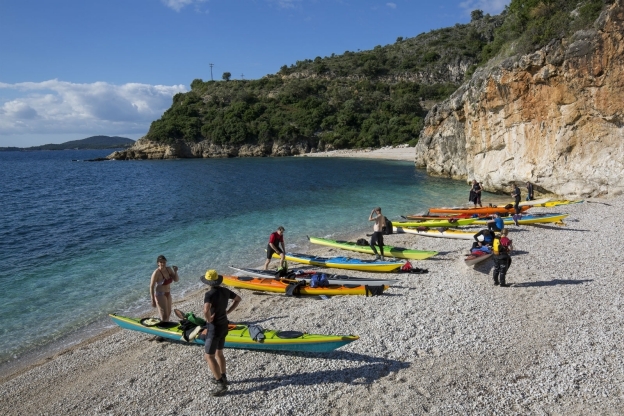 Also in its second year, Kayak Tara Fest is a grassroots event that has a simple purpose: to promote kayaking as a sport in Montenegro and share the beautiful, pristine rivers of the country with the international paddling community. The Tara River acts as the border between Montenegro and Bosnia and Herzegovina with a thousand meter canyon that’s one of the deepest canyons in the world. Organized by the Montenegrin NGO, Nature Lovers Montenegro, the event aims to build on its inaugural year (2016), which saw 50 racers from 10 countries and hundreds of people attending for the concerts. 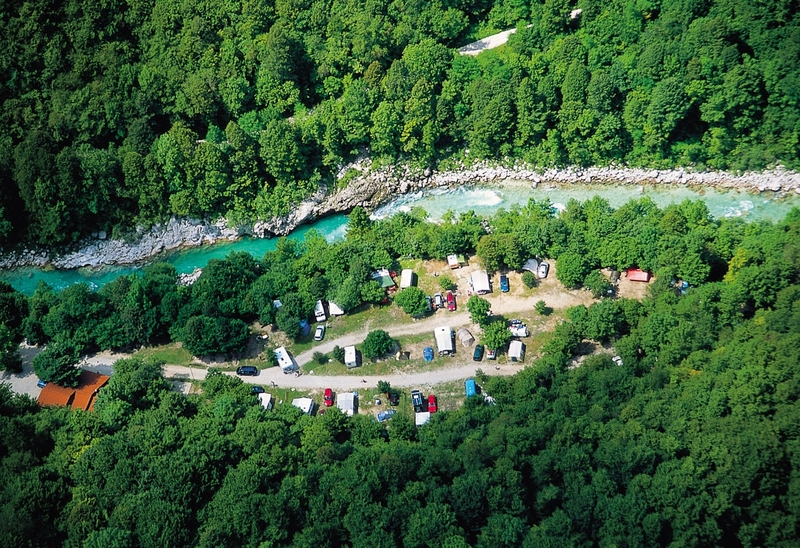 The festival is located at Camp Grab near Plužine in northern Montenegro, perched on the edge of the Tara River. Logistics are simple, with the Podgorica International airport just a 2.5 hour drive and Tivat, Dubrovnik and Sarajevo airports all around three hours away. Even better, the festival organizes buses to transport festivalgoers and racers from Nikšič the day before the event. Kayak Fest Tara features four kayak races: downriver, boater X, head-to-head and slalom race. 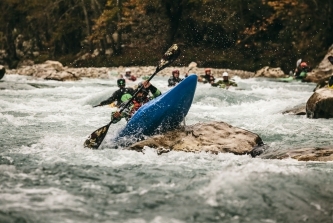 Racing takes place on a stretch of class II whitewater, making it a perfect race for new paddlers. The events are open to all levels of kayakers and races are designed to test skill and speed while building a sense of camaraderie and community. 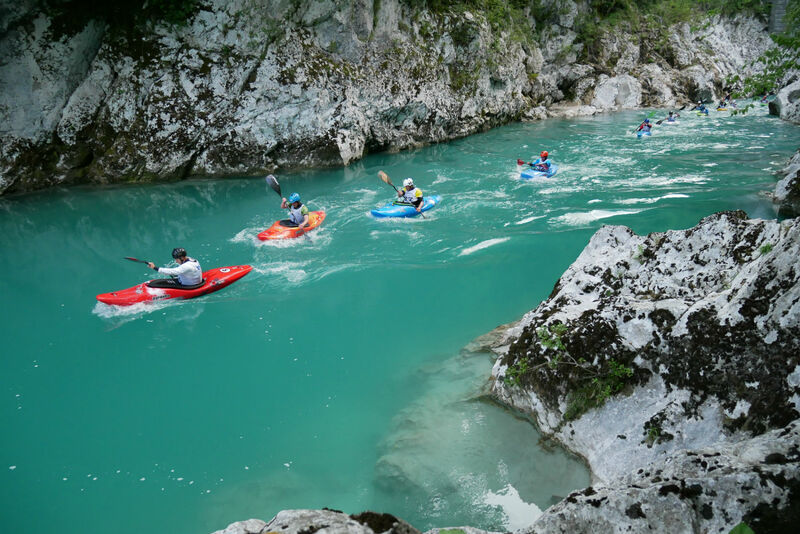 For those looking for more challenging whitewater, the Piva River is a just a half hour drive from Camp Grab and offers class IV whitewater during weekdays when the dam release occurs. 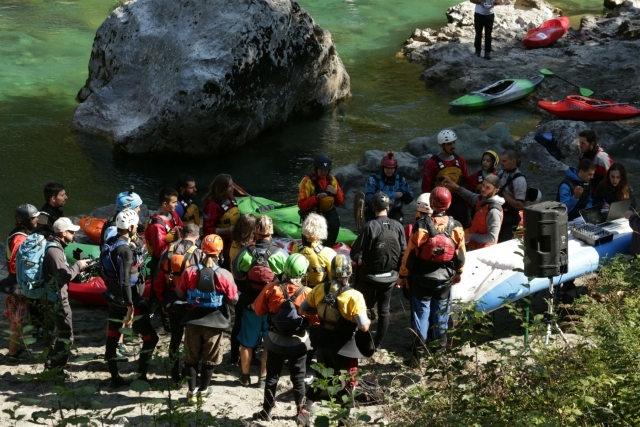 The festival organizes a shuttle for Piva and upper Tara laps, as well as other surrounding rivers depending on water levels. Montenegro is a small country, just 5,333 square miles (a quarter of the size of Costa Rica), but is home to some of the last free-flowing rivers of Europe. Even though the Tara canyon is under UNESCO protection, plans to dam and flood the canyon have been on the table since 2004 with public protests, petitions and scientific studies slowing progress. Kayak Fest Tara helps raise awareness of the dams and hydropower projects threatening the Tara and other wild rivers of Montenegro. Dam construction on this gem of whitewater is never fully off the table, which makes Kayak Fest Tara an important event. It’s about more than paddling, but showcasing the potential for year-round paddling tourism. It’s about conservation and enjoying one of the most beautiful rivers in Europe. A four-day festival with friendly locals, a great cause and camping, meals, music and racing all for just 50 euros? Hard to beat. Easy to join. Pairs well with: A Greek coastal vacation without the crowds. After the summer heat passes, tourists in Greece dissipate, and the kayaking season gets its second wind. With bright fall colors, sunny 20-degree days and intermittent rain that brings prime water levels, autumn creates a playground for paddlers and a great out-of-country excursion for paddling clubs and groups. 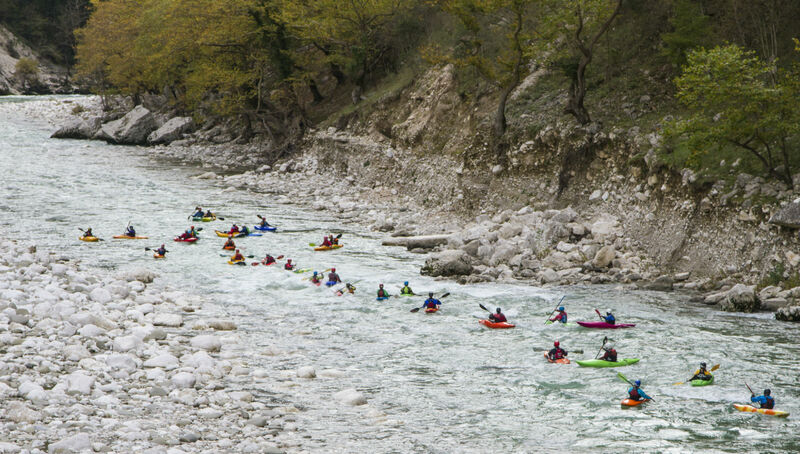 The Pindos Outdoor & Kayak Festival creates an inviting and relaxed atmosphere to introduce kayakers to the whitewater of Greece. Over the course of this week-long festival, paddlers create their own agenda but have the chance to be guided down the Arachthos and Kalaritikos Rivers as well as day trips to sea kayak on the Ioinian Sea. 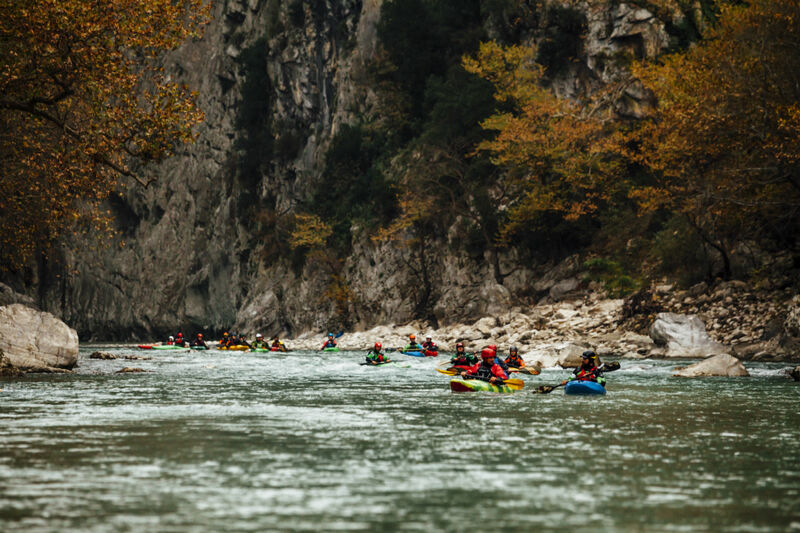 With kayak schools and outdoor companies present, gear rentals and boat testing make it a community event, further developing the sport in Greece. The festival is based out of Via Natura Campsite on the banks of Arachthos River just outside the small village of Plaka. Greece. Outdoordirekt, the local Greek paddling school, puts on the event in collaboration with the German kayak school Toros Outdoor. The festival fee ranges from 150 to 300 euros, which includes camping, a welcome dinner, festival hat, and guided tours. Kayak and bike rentals are extra, as are rooms at the traditional and hand-built Hotel Teloneio just across the bridge from the campsite. Hotel owners Nikos and Marina Manthos will blow you away with their home cooked food, warmth and hospitality and the incredibly beautiful hotel architecture. Fueled by Greek hospitality and saturated in a chill vibe, participants organize their own day—early starts or slow mornings, whatever suits their group. Outdoordirekt and Toros Outdoor plan guided trips down the Arachthos and Kalaritikos Rivers and provide gear rentals, organize safety workshops and technical lessons too. When fall showers raise water levels, daytrips on the Acheron, Acheloos and Voidomatis rivers are organized, but the dam released Arachthos always has water and the mildly technical boulder gardens running through the picturesque karst canyon give paddlers a feeling of being on a remote river while taking out at the Via Natura campsite. 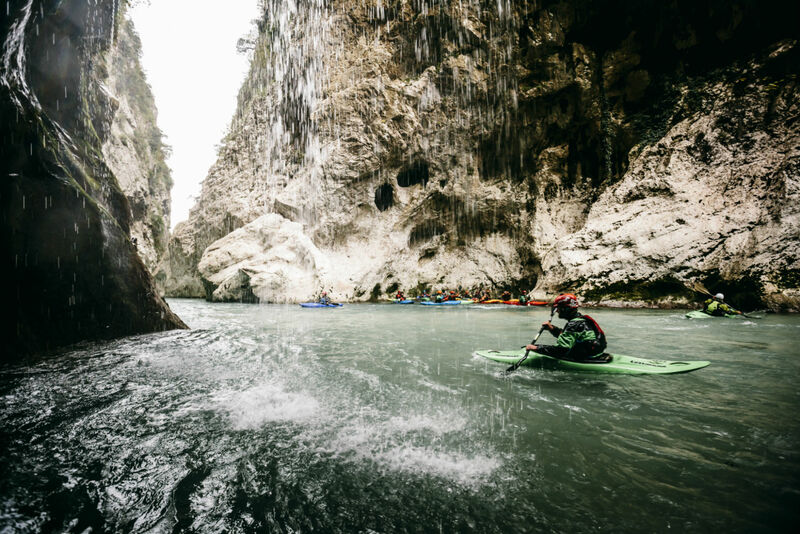 Non-kayakers can also experience the unique Arachthos Canyon from a raft or swap boats for boots or bikes to hike or pedal the mountains of northern Greece, taking in the colors of the Tzoumerka Mountains where trails of all levels are plentiful. 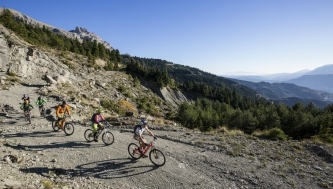 Via Natura offers a mountain bike shuttle service, where guests can ride to camp from almost 7000 feet and sea kayak rentals are also available with guided tours on the Ionian Sea just two miles away. Pindos Outdoor Fest is all about paddling, mountains and relaxing. Paddle northern Greece in a relaxed atmosphere, with great food, comfortable accommodation and the chance to get deep in the canyons. Gather your crew. Book a week off work. And learn to steep creek, night paddle, race and run canyons at a kayak festival with roots and soul. Put it on the calendar now. Make it a yearly event. Editor’s note: Cover photo (Arachthos River) courtesy of Flo Smith.